Does the idea of a toddler temper tantrum have you fearful of taking your young child out to dinner? Have you tried to enjoy brunch with your preschooler, only to leave the restaurant with a red face? Taking kids out to eat can be tricky, but not if you know the keys to success. Choose wisely. Have you been meaning to try that new Thai place around the corner? Is there an austere new French spot with a cutting-edge menu you’ve been dying to visit? This is not the time. Look for a family friendly restaurant that knows exactly what to expect when kids walk in the door. 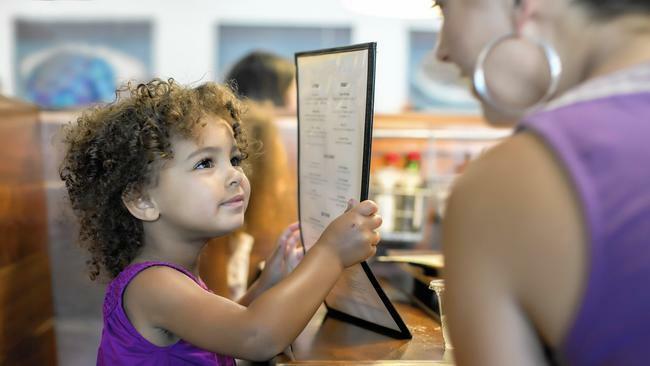 A good indicator is the presence of a kids’ menu, which you can scan for your child’s favorite meals on the restaurant’s website. And you may want to call the restaurant to ask if they supply high chairs, plastic drinking cups, and crayons and paper for coloring. If the answer is yes, you know that your little one will be welcome. Be prepared. You’d be wise to take with you a few extra crayons and a pocket-sized coloring book, or a Magnadoodle, in case your child breaks or loses the restaurant’s crayons. Also, pack a few items of food you know he’ll eat in your bag. Just in case he refuses his entrée, you’ll have back-ups on hand to avoid a teary situation. And don’t forget your wet wipes. At the end of the meal, the high chair, the table, and your child, will likely need a wipe-down. Order early. While Emily Post might not approve of ordering before you’ve even received menus, you might want to ask for a cup of juice and a side of fries once you’ve been seated. The waitstaff will understand, as they know that an impatient child can quickly become a crying child. Little people have little attention spans. Keep an eye on your child’s mood, and when it shows signs of darkening, ask for the bill in case you need to make a quick exit. Unless your child is very happy where she is, avoid ordering coffee and cocktails after dinner, as a long, relaxed meal is not exactly a child’s idea of a good time. If she asks to leave the table once she’s finished eating, remind her that while she needs to wait for everyone else to finish at home, at a restaurant, an exception can be made. A quick stroll to the lobby, an exploration of the shrubbery out front, or a walk around the block may reboot her attention span and buy you another twenty minutes at the table. Set expectations. If dining out is a new experience for your child let him know exactly what to expect. Describe the restaurant you’re going to, tell him that he’ll be sitting in a high chair or booster, and that he’ll be expected to stay seated and speak in his indoor voice. Remind him that he may have to wait for his food, but that you’ll do your best to help him keep himself busy. You may even want to refer to some of the items on the menu and ask him what he thinks he might like. No, this is not every adult’s idea of a relaxing dinner out. But it’s a great way to ease your child into an adult situation, and after a few more dinners out, or Sunday brunches, your little one may start to become a pro, and a popular diner at one of your favorite neighborhood restaurants.